On the slopes of Olympus, a mere 5 km from the beaches of Pieria, Ancient Dion, the Holy City of Macedonia was found under a covering of undergrowth and water. This city had been a thriving centre of civilization from the time of its foundation for a period of 1,000 years from the 5th c, BC to the 5th c, AD. We learn from Ancient Greek writers that the Macedonians regularly gathered in Dion to worship the Gods of Olympus, and to make sacrificial offerings, as can be seen from the objects found on the site. It was here that King Archelaos organized athletic competitions and theatrical events, and Philip the Second celebrated his victories at Dion, as did Alexander. It was here that Alexander gathered together his troops to prepare for his journeys of conquest, worshipping Zeus, King of the Gods of Olympus. In the temple of the Gods of Olympus was a magnificent bronze statue created by Lissippos, which depicted the 25 horsemen who died at the Battle of Granikos. During the reign of Philip the 5th after a disastrous invasion, the Aetolians ransacked the city. 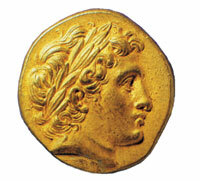 At the Battle of Pydna, 168 BC, the death of Perseas, last King of Macedonia, brought an end to the Macedonian Dynasty. Dion became integrated into the Roman colony during the reign of Augustus. The second peak of the city came during the Roman occupation in the 2nd and 3rd centuries AD, when it became “reborn” as a Greek city. The final days of Dion were written when it was destroyed by an earthquake and floods in the 5th c AD. The terrified citizens of the city took flight and sought refuge on the higher slopes of Olympus. The Holy City of the Macedonians collapsed and its ruins lay beneath the soil of the Macedonian earth.